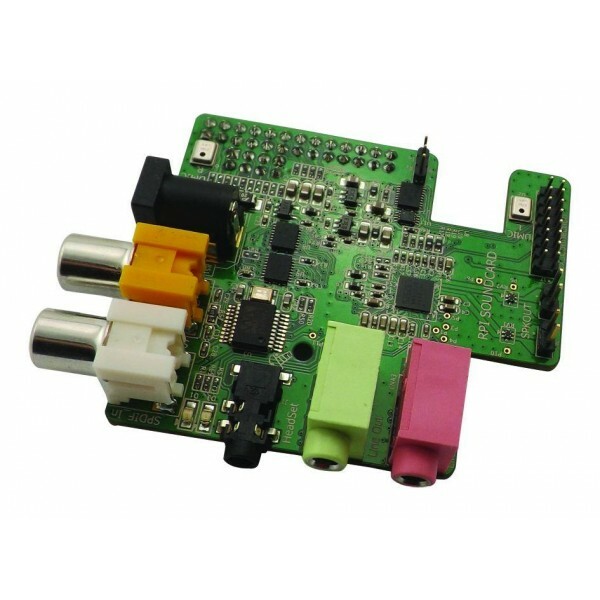 Just ordered a Wolfson Audio Card for Raspberry Pi via RaspberryStore. I asked them about this audio interface at their stand during the NLLGG meeting where I did a presentation about doing real-time audio with the RPi and they told me they would ship it as soon as it would become available. They kept their word so I’m hoping to mount this buddy on my RPi this very week. Hopefully it will be an improvement and allow me to achieve low latencies with a more stable RPi so that I can use it in more critical environments (think live on stage). It has a mic in so I can probably set up the RPi with the Wolfson card quite easily as a guitar pedal. Just a pot after the line output, stick it in a Hammond case, put guitarix on it and rock on. I’ve been a little surprised by the poor latencies I observed with the pi so far. Will do. I’m now testing with amsynth and so far the Wolfson does a nice job. I can run jackd with -p64 -n2 but I get quite some xruns. With -p128 -n3 it seems to cope well. Before I can test guitarix I need to do some soldering and haven’t found time to do so yet. The Wolfson comes with a 4-pole TRRS 3.5″ jack so I have to solder a converter to female jack (edit: it’s actually a TRS connector so have to figure out how to hook up a mic). Compiling the kernel with the Wolfson drivers was a no-brainer and it booted straight away so that’s a big plus. Hi Georg, you’re welcome. I’ve had little success with a RT kernel on the RPi, it didn’t work that well. Maybe I should give 3.12 a try. I’ll try to get it working and post the results here, if that’s o.k. for you. Hi – Please describe in detail how/if you manage to get the wolfson running on a 3.13 (or 3.14) based kernel. until now I got the 3.12 based kernel running together with the wolfson card. In 3.14 a lot of things have changed. At the time of writing this I got the rt-patches for 3.14 cleanly applied to the rpi-kernel. Getting the Wolfson kernel modules running is not quite easy, because they have to be adapted to the new sources. With 3.12 it wasn’t a big deal. Maybe 3.14 is not so easy. When I get it running I’ll make it available online. Bad news… it does NOT work 🙁 Kernel doesn’t even boot. Only multicolored screen. No more. Because I don`t have a gpio serial adapter I can`t investigate the reason for this. Tomorrow I’ll try the rpi kernel without the Wolfson patches with rt preemptive patchset. Hope that this will bring some better news. Hello Georg, keep us posted! I’m also very interested in patches/diff for the 3.12 kernel. From what I’ve understood this kernel patched with the RT patchset performs better than the 3.10.25-rt23 kernel I’ve tested. I’ve found the non-RT 3.10 kernel performs better. of course you’ll get these patches. But please be patient for some days, cause I’m sick since the last few days (got the flue). If everything’s right with me I’ll make the patches available some time around Easter. Maybe before, maybe afterwards. Only splash screen. Maybe there’s something wrong with the source tree. I’m checking out the kernel sources for 3.14 again right now and try it again. try to patch the sources later and let you know. If it works, I’ll upload the patches immediately. Hi, this is good news. My main interest is the Wolfson patches for the 3.14.1 kernel – how you managed to do that is impressive. My first quick and dirty howto on compiling the wolfson drivers for 3.12 kernel on raspberry pi. Great!! Thanks! I’m going to try this out during the 2014 Linux Audio Conference and I’ll post about it! did it work for you? Somebody wrote me that git couldn’t find the sha-1 posted in my howto. Here you can find some the sources and binaries. Please test and report. Thank you guys for the good work ! So let’s say I buy this card, how much work will it take to have it worjing with Raspbian ? Is there any chance support will simply come with the next Raspbian release ? Cheers. I’m using Georg’s kernel (binary – thanks!) and it’s working nicely! I have the autostatic repo configured, but I don’t know how to replace the raspbian jack with the autostatic jack2 (compiled without dbus I think)? 3.12 doesn’t work with the JACK packages from my repo because of the missing /proc/cpuinfo entry issue. This was solved with more recent JACK versions so you’d better reinstall the JACK version from the official repositories. If you want to use JACK without X11 why not use Jack1? If you really need Jack2 you can get it running without dbus: http://linuxmusicians.com/viewtopic.php?f=6&t=10477 and start at “Now add the following lines to /etc/dbus-1/system.conf if you want to use JACK without X”. First of all, thank you very much for all the sharing you done so far (I see you everywhere when it’s related to rpi / audio). Doing: sudo apt-get remove jackd2 installed jack1 and now it’s working nicely. I can start jack with: jackd -P84 -p8 -t2000 -dalsa -dhw:0 -r48000 -p1024 -n3 -s & BUT I am getting this error from time to time: delay of 221756.000 usecs exceeds estimated spare time of 21274.000; restart …??? I was wondering if -P70 is better than -P84? I think I have done all I could to lower the latency / glitch (killing unused process, limits.conf, no X11, …). Apart from this error and the glitches from time to time, the roundtrip latency is very good, I can get as low as 7ms with -p256 (measure via a loop cable SPDIF in/out and puredata patch). Let me know if you have any idea about this error. I just want to add that no matter what I put in jackd (-r -p -n) I have this error (usecs exceeds estimated spare time of). Hi! I already tested Wolfson audio with guitarix and rakarrack! The Latency is so low!! Now I just want to know how can I use the onboard DMIC? By default JACK uses 2 capture devices and 2 playback. 1 input is the Line IN, but the another one I don’t know what it is. The 2 playback devices are really just one: L and R of the Line out. Maybe you’re wondering why I want to use DMIC. The answer is this: Vocoder. Rakarrack have a vocoder plugin included that I would like to test. By the way, I also compiled & installed two vocoder plugins (One is a LADSPA, and the other one is a LV2 plugin), but none of them is listed by Guitarix. The MDAVocoder (LV2) works here with the guitarix-git version. Hello Pat, do you get the “usecs exceeds estimated spare time of” messages when using PD or also in other situations? And -P84 or -P70 shouldn’t make any real big difference but you might want to check which process is using which rtprio with @ps -eLo pid,cls,rtprio,pri,nice,cmd | grep -i irq@ and @/etc/init.d/rtirq status@. Hello Mr_LinDowsMac, LADSPA plugins should get detected by the guitarix version that is in my repository. Do you happen to know where it is installed? I could upload the vocoder-ladspa package to my RPI repository if you want. And for using the onboard mic’s, check the documentation, I think it’s just a matter of running the right Wolfson script. I don’t have rtirq in /etc/init.d? The “usecs exceeds” show up from time to time causing glitches in the sound. Am I the only one with this behaviour? What kernel / distribution do you use? Hey this should be of use for pat as well. I upgraded the alsa-base package and things seem to work now! I fixed some problem this week-end. Recompile the kernel using this tutorial: http://www.talkunafraid.co.uk/2014/04/real-time-kernels-and-audio-on-the-raspberry-pi/ Since then, I don’t have usec exceeds anymore. But I still have problems with jackd(1/2) and alsa. How did you upgrade als-base package (what repo, command)? Using a lowlatency PREEMPT kernel probably works better than using a realtime PREEMPT-RT kernel on the Raspberry Pi. I haven’t tried 3.12-rt yet but I’m getting the idea that with a RT kernel the RPi is performing worse than with the default lowlatency kernel. I don’t think so. For me the 3.12 kernel works much better than the default one. The above mentioned error sometimes occurs if the alsa midi stuff doesn’t work. Restart the midi daemon and then restart jackd2. everthing o.k. with your website? Hi Georg, the website should be ok but the behavior you report is weird and shouldn’t happen. You’re sure you’re not using some kind of spell checker? Hi Georg, that’s great news! That makes things a lot easier! How did you create the deb? Jeremy, Does the Wolfson audio card really work for you? With what Pi distro? Can you connect a camera with the Wolfson? Can the Alamode board (arduino for Pi) fit above or in between the Wolfson and the Pi? Did you look at the HiFiBerry DAC ? I would like to demonstrate the Raspberry Pi running PD-L2ORK at North West Linux Fest at the end of April and I would like to get a sound card that “just works”. Even the little USB cards seem to need some additional tweaking to work right. Your advice is appreciated, reply to my email if you choose. hope you don’t mind if I give you some answers here. The camera (PiNoir) works fine here. Connected to a raspberry pi with wolfson audio it works like a charme -battery driven!